Protein is a vital component of any diet. Whether your goal is weight loss, building muscle, or improving your overall health, it's important to include protein-rich foods in your diet. Depending on your dietary needs and preferences, knowing how much protein is in chicken may not be as important to you as knowing how much protein is in a non-meat source like black beans. We all need protein to ensure our bodies are functioning optimally. Protein is required to support muscle, the immune system, and the brain. Your body requires adequate protein to break down and use some essential amino acids. It's also needed to make several proteins in the body, like hemoglobin and antibodies. 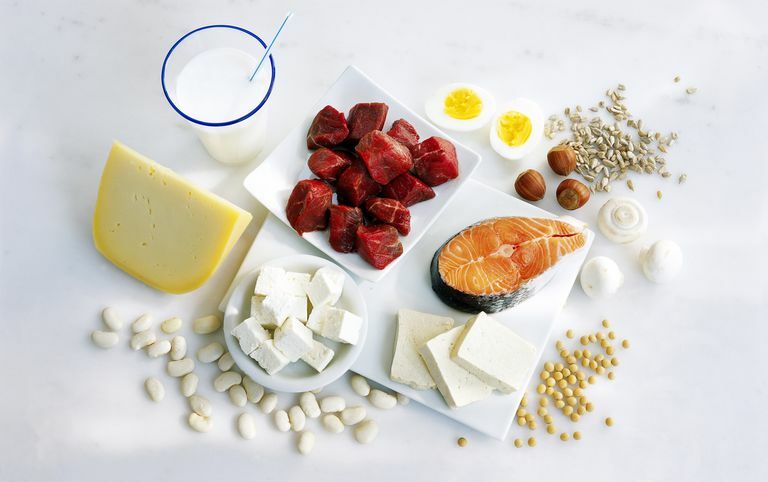 Your weight loss and management goals can be aided by a diet with plenty of protein-rich foods. Since your body takes longer to digest these foods, you'll feel satisfied longer when you satiate your hunger with protein as opposed to quickly digested carbs or sugar. If you become protein deficient, you may experience muscle wasting and poor wound healing. Protein deficiency can also make you more vulnerable to infections, some of which may be serious or difficult to treat. Once you know how much protein you need, you can build a meal plan that incorporates the high-protein foods you like best. While chicken, fish, and red meat may be the most obvious sources of dietary protein, if you follow a vegetarian or vegan diet you can get protein from plant sources like beans, nuts, and seeds. Here's a more in-depth look at high-protein foods, with the grams of protein in common servings and measures. Keep in mind that these guidelines are general rules of thumb and protein sources can vary, especially according to how they're prepared and cooked. Chicken and turkey are excellent sources of lean protein. One ounce of skinless poultry has approximately 7 grams of protein when cooked, or 6 grams of protein per ounce when portions are weighed before cooking. At about the size of a deck of cards, a 4-ounce portion of chicken or turkey provides 35 grams of protein. Once cooked, chicken can be prepared in a variety of ways. Cooked hot or served cold, chicken can be eaten on its own or included in a wide range of dishes including sandwiches and wraps, salads, and soups. Here's a helpful list of how many grams of protein can be found in a typical serving of the different parts of a chicken or turkey you might eat or cook with. Most cuts of beef have around 7 grams of protein per ounce. If you don't eat red meat often or limit your steak consumption to grilling season, you can still get the benefits with smaller servings: a quarter-pound hamburger patty provides most of your protein needs for the day. Fish and shellfish are a central source of protein in cuisine around the world. When cooked, most types of fish have around 6 grams of protein per ounce. Oily fish like salmon, tuna, mackerel, and sardines also provide beneficial omega-3 fatty acids. If you're pregnant, plan to become pregnant, or preparing meals for children, you may want to choose seafood with lower levels of mercury. Pork has about the same protein content as beef and poultry. As with other types of meat, ask for lean cuts and remember the way you cook and serve meat, as well as your portion size, all affect its nutritional value. Keep in mind that cured pork products like bacon and Prosciutto, as well as some deli meat, can have high amounts of salt. Highly-processed pork products like hot dogs can also have preservatives, additives, and even hidden sugar. While they're typical breakfast favorites, eggs and dairy products can add protein to other meals, too. Whether you cook them up with the yolk or just the whites, eggs also offer up more than protein: they're a good source of micronutrients like choline, selenium, and B-complex vitamins. If you tolerate lactose, dairy products like milk and cheese present versatile ways to add some protein to your diet—though they also add fat. If you're trying to keep your fat intake low, opt for dairy products made with skim milk or have smaller portions of the full-fat version. Some vegetarians include milk and eggs as a protein source, though neither is included if you follow a vegan diet. Beans are a staple source of protein for vegan and vegetarian diets. Compared to animal protein sources, beans are lower in some essential amino acids. As long as you eat a variety of plant-based proteins, you are unlikely to become deficient. You can get creative with tofu, a protein source derived from soy. Depending on whether you get smooth silken varieties or firmer ones, tofu can be added to smoothies and shakes, tossed in a salad, or used as a meat substitute in just about any cooked dish from noodle bowls to nachos. Tofu is suitable for many dietary needs and preferences: it's low-carb, gluten-free, dairy-free, and vegan. As with beans, nuts and seeds are high in protein and can give a boost to vegan or vegetarian diets. Note that the amount needed to supply a protein equivalent is less for nuts and seeds than it is for beans. In addition to protein, most nuts and seeds provide polyunsaturated fats, fiber, minerals (such as magnesium and calcium), and phytonutrients. Protein powder can be made from whey (milk) protein, egg, soy, rice, peas, and other sources. The amount of protein and carbohydrate in different protein powder brands will vary depending on the source, so be sure to check the labels carefully. Many protein powders are marketed to bodybuilders and athletes, so be sure to check the ingredients for any unneeded (or unwanted) additives. All About the Protein Foods Group. Choose MyPlate. https://www.choosemyplate.gov/protein-foods. USDA Food Composition Databases. USDA. https://ndb.nal.usda.gov/ndb/. National Library of Medicine. What are proteins and what do they do? Genetics Home Reference. https://ghr.nlm.nih.gov/primer/howgeneswork/protein. Published 2019.